Friday evening, I drove to Lander for the annual Popo Agie Quilter's show. I know some of the ladies in this group and love to see the projects they have on display. One of my favorites in the show was actually on the back of a quilt by Pat Welch. 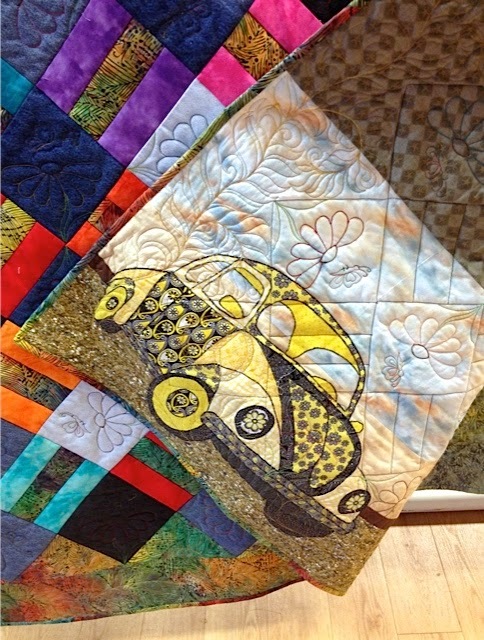 The appliquéd VW Beetle was so cute! This quilt didn't have a name, but I think either Flower Power or Feelin' Groovy would be appropriate. The batik fabric reminds me of the 60s tie-dyed fabrics. This quilt and its clever back made me smile and begin humming Feelin' Groovy. Saturday was a gorgeous day: about 70 F and a slight breeze. The weatherman predicted rain on Sunday, so it was a good time to rake some leaves and get them off the lawn before the weather changed. I filled my yard waste container and borrowed those of two neighbors - the front lawn was somewhat clean for about 30 minutes. 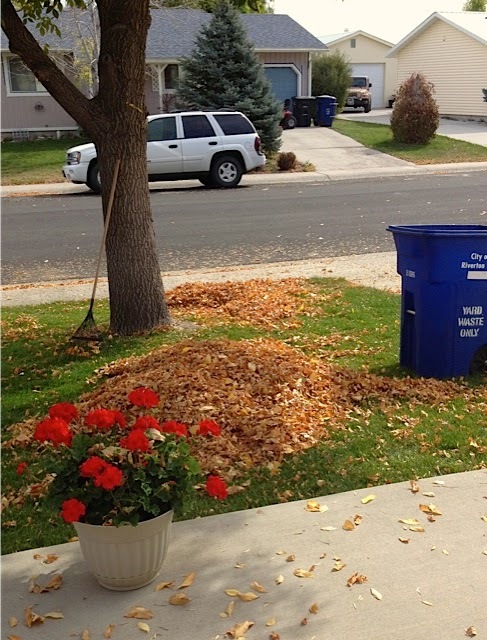 Many, more leaves need to fall, but at least I got a bunch of them picked up. I have two large, ash trees in the front yard, and one in the back yard. Thousands of leaves have yet to turn golden or even think of falling. My days working in the yard have only begun. You may not remember what I faced last year at this time. Same day, same view - totally different weather. That's Wyoming! I've featured festival floats in previous Foreign Fridays, but today's photo shows the base of the float and how they are not only pulled by individuals but also steered by someone inside the float. Update: Just to clarify, the trailer does not have a motor. 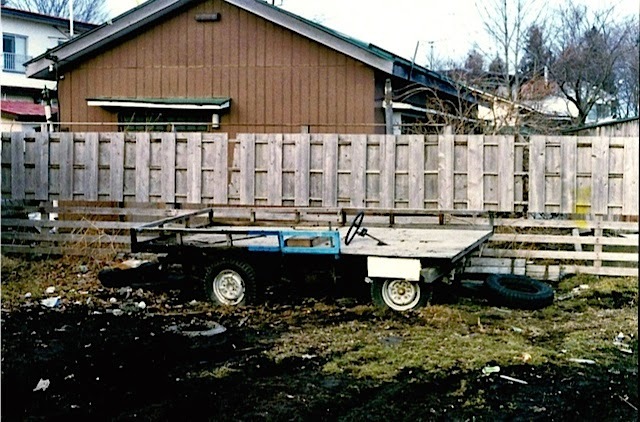 The steering wheel allowed the trailer, which was pulled by individuals, to maneuver the narrow streets during the parade. 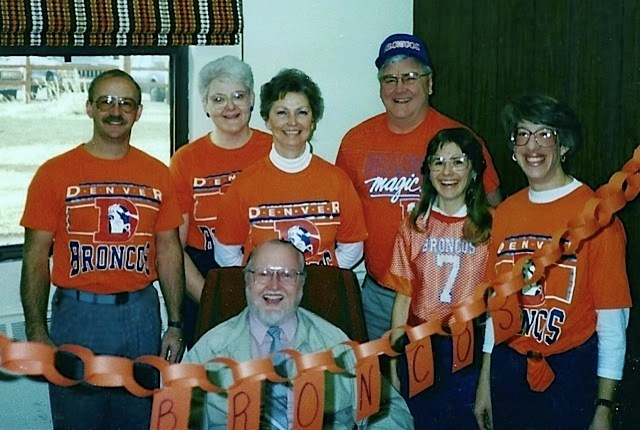 Most of the staff at Wind River High School were Denver Bronco fans, and if they weren't, they got a bit of ribbing from those who were. Hank T. was the principal, ironically from Denver, and was a Raider's fan. The staff donned Orange Crush shirts and decorated Hank's office to leave no doubt that WRHS was Bronco territory! 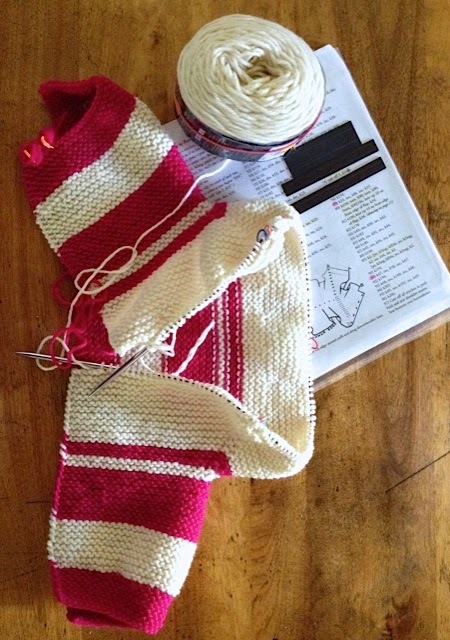 Hopefully, I will have enough yarn (it's scraps) to finish this Baby Surprise Jacket. I had hoped to knit a mirror image of this BSJ, but clearly that is not going to happen. Now, I'm just aiming for finishing the sweater with the yarn that is remaining. In high school, I belonged to such a "wild crowd," a group that included upper and lower classmen. We were involved in music, pep club, and Future Homemakers of America - no girls' sports in those days, we were much too delicate to sweat. 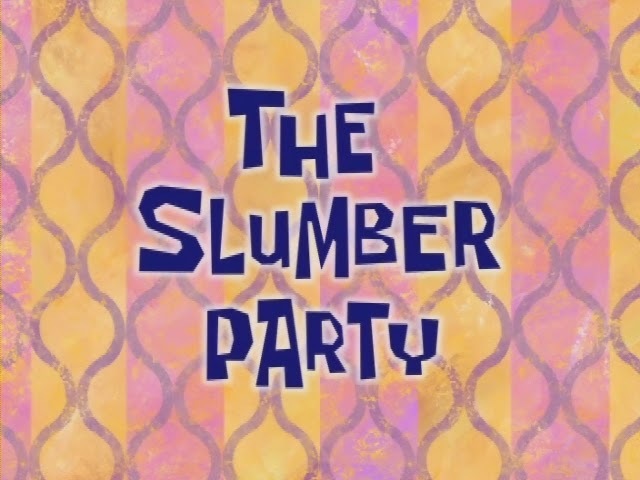 Frequently through the year, we had Slumber Parties: I remember staying at Cathy, Darla, and Nancy's houses. 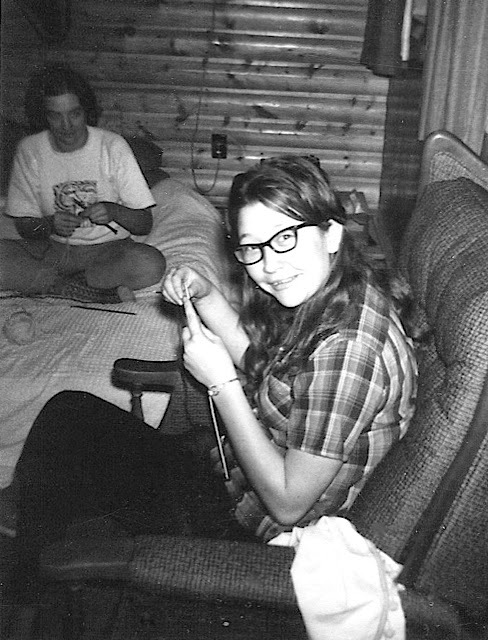 It may come as a surprise that one of our activities at the slumber parties was knitting, and I have the photos to prove it. 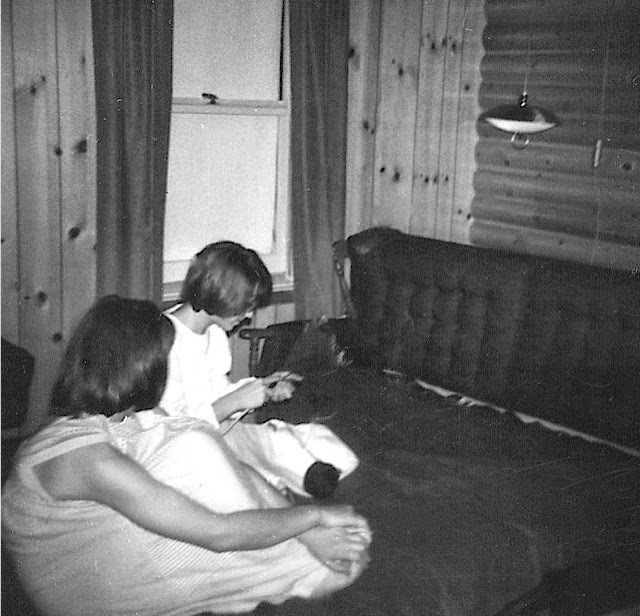 Cathy R. in background and Eugenia T.
Slumber Party at Nancy J.
Margaret B. and Nancy J. Now, Nancy (High Plains Footprints) and I knit with a group that meets every Tuesday evening. 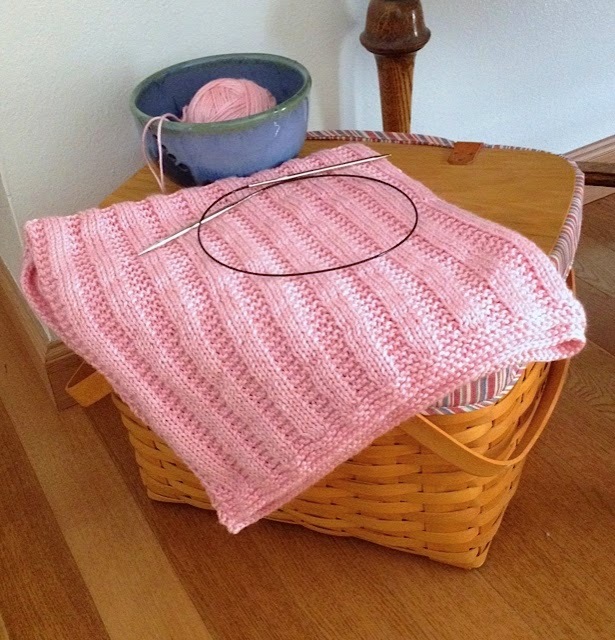 Did you knit with friends or attend slumber parties when you were in high school? The Humbags are packaged and ready to mail to the winners. Winners, please send me an email with your mailing address. On weekends, I put on my walking boots, grabbed my camera and wandered around the countryside. Sometimes, I went alone; other times, with friends. I saw more of the "real" Japan than those who stayed on the highways and in town. 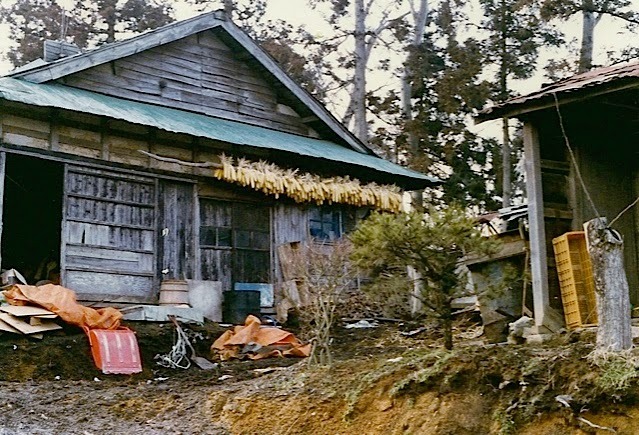 I found beauty in the raw images of rural Japan. Note: that is corn drying under the eave of the barn. I was recently invited to sew with a group that meets at the Lander library each month, so last week, I loaded my sewing machine and supplies and drove to Lander. The project for September was Humbug bags. The bag was inspired by an English sweet, called a humbug. I'd seen the bags before, but had never made one. I completed a small bag from the supplies I took to the sew-in as well as bought some kits for larger bags from Mary, the group's coordinator. Some of the bags were made as gifts, and the ones pictured above are my gifts to four lucky readers. The bags are approximately 12 inches long and are constructed with oilcloth. They are a good size for knitting or other crafts as well as a ditty bag for travel. If you want to be included in the drawing for a bag, tell me in your comment which one appeals to you. 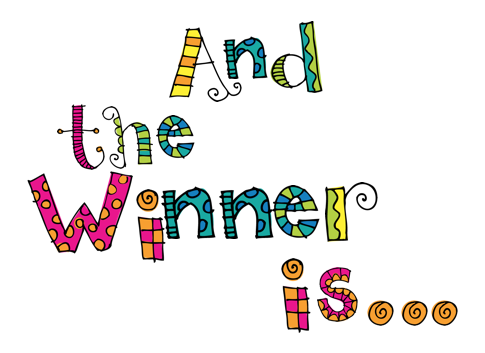 The winners will be posted on Monday, September 22, 2014, so you have until noon on Sunday to enter the drawing. 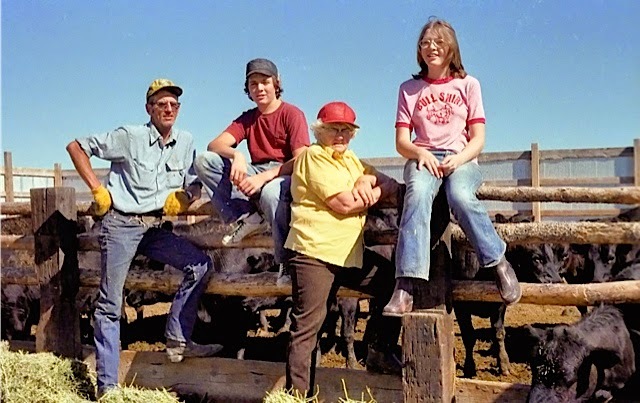 Rich S., Dwight M., Rosa S. Brenda M.
My nephew and niece from Denver came to the farm and worked for Grandma Rosie for several summers. They milked cows, fed calves, cleaned the barn, fixed meals, mowed the yard, irrigated, worked in the field, and fed cows. Dwight and his cousin Bruce (from Fargo, ND) slept in a camper near the house and next to the irrigation ditch. Brenda and her cousin Becky (from Fargo, ND) slept in the house. Some evenings we played Spoons and Nertz, card games that can be quite competitive. I use a simple Bulldog clip to help me see my progress when twining. 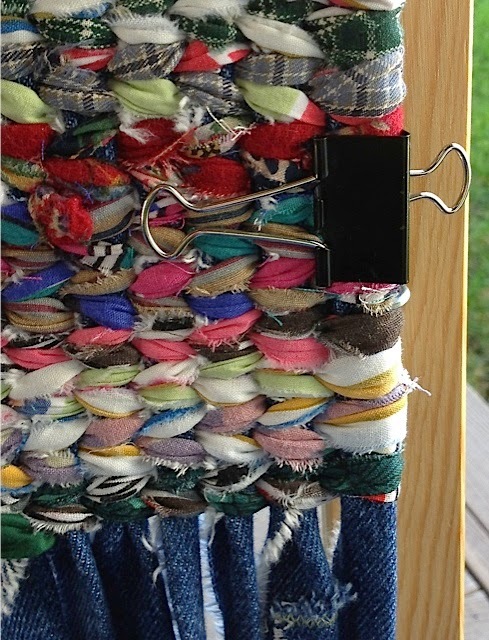 I move the clip to the bottom of the last row and twine from that point. The photo shows that I've added about an inch since I last moved the clip. An inch may not seem like a lot, but it sometimes can take 30 minutes or more to twine an inch. When knitting, I often attach a removable stitch marker so I can see my progress. These clips and markers keep me motivated on seemingly endless projects. What tricks do you use on projects for motivation? 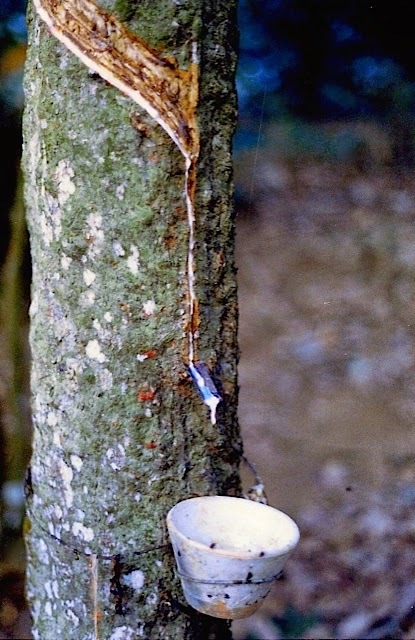 The notes from my travel journal state, "The rubber tree plantation was the last stop today. 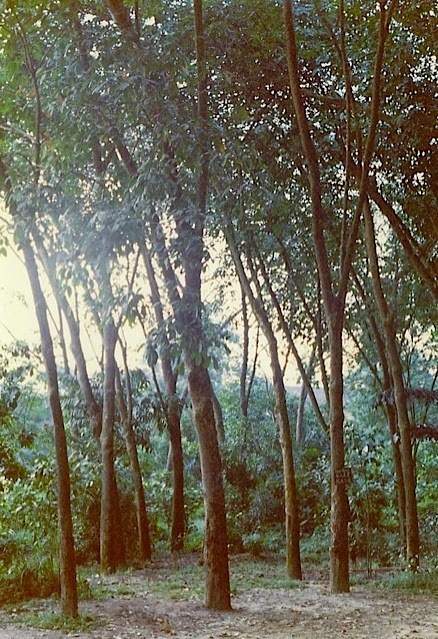 A British commander smuggled 22 seeds from Brazil and only 9 seedlings sprouted and were then planted in Singapore. 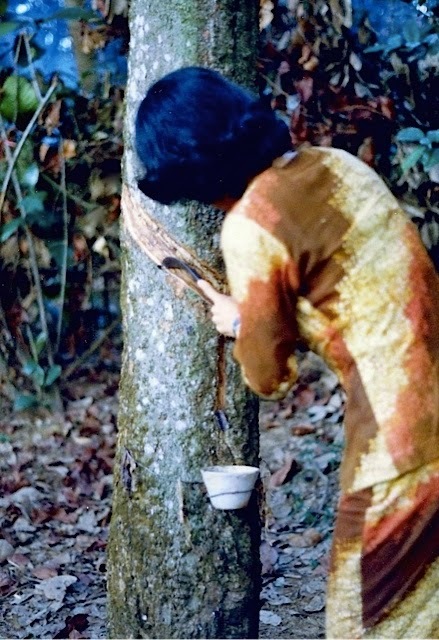 Singapore became the rubber capital for some time. The American company, Goodyear, discovered vulcanization and rubber tires thus caught on." Up until this tour, I had no idea where rubber originated. Other notes from my journal: "Gas in Singapore - $2.30 a gallon. The government encourages car pooling in the morning and taxes cars for having less than four people inside. The cars on the streets are less than ten years old because older cars are taxed double." Temperatures have been in a state of flux the last few weeks as Autumn creeps down the mountainside. It can be 80 F one day and 50 F the next. I usually start the day with the house closed and fling open the windows and doors by mid-day. I added a down comforter to my bed about a month ago, and in another month, I'll probably start using the flannel sheets. Recently, I've been trying to twine outside as much as I can. The lint and strings can be easily swept off the deck, and I can enjoy the gentle breezes. All too soon, it will be too chilly to twine or to knit outside. How do you like to spend Autumn afternoons? The oat fields are just starting to turn golden in this area, and soon the harvest will be underway. 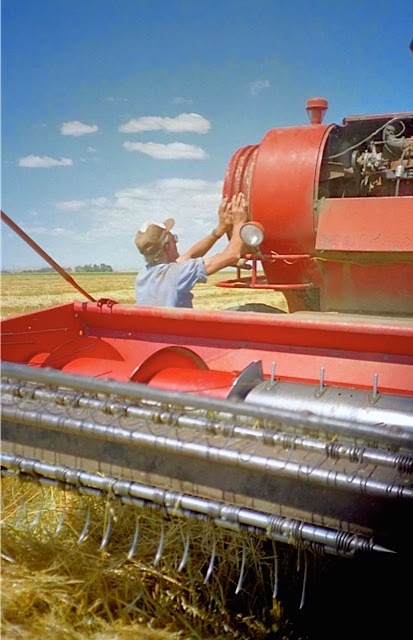 Harvest for other crops (malt barley, oat hay, alfalfa) have already begun or are finished. Soon, the silage will be cut, sugar beets dug, and beans combined. It's a busy time of the year for local farmers. I really don't know how my brother managed to get everything harvested, as he and my mother also milked cows twice a day. My oldest brother, John and sometimes his son, Larry would come out and help during the harvest. When they weren't available, Rich would combine the oats, fill the truck box and then drive the truck back to the farmyard and unload the grain into the bin. Often he would combine even at night. 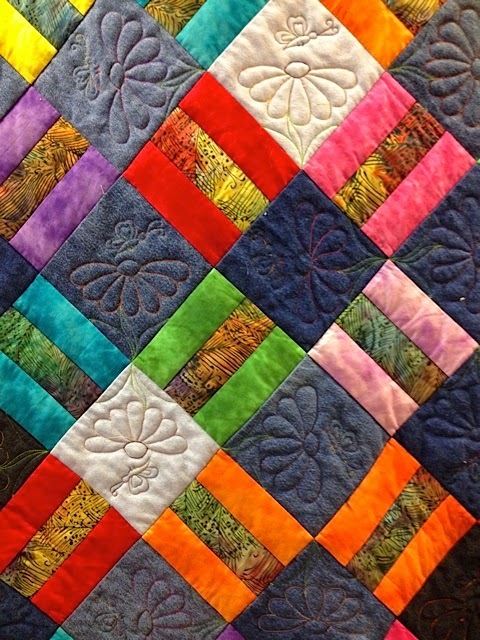 Binding is the last step in the quilting process. 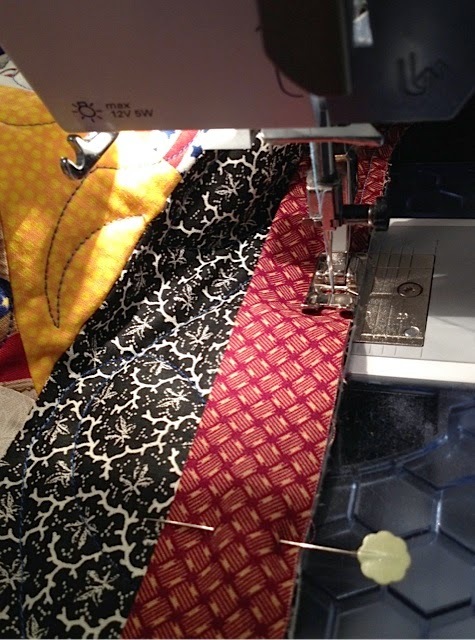 For Quilts of Valor, the binding is sewn on one side and drawn around to the other side and tacked by hand. Since I received three quilts back from the volunteer long arm quilters last week, I've been busy doing the finishing work. 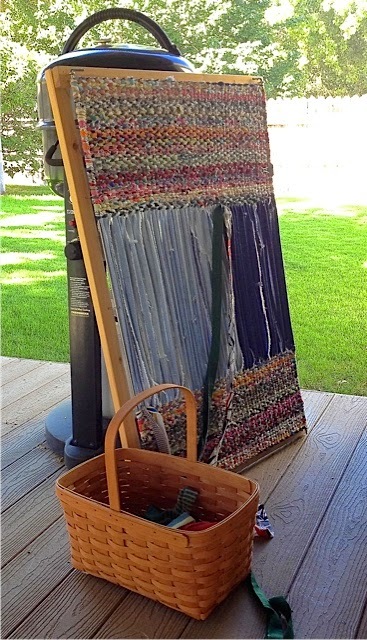 Recently, I received several quilts back from long arm quilting volunteers: two quilts from Boise, ID, two quilts from Cheyenne, WY, and one quilt from Miles City, MT. Today, I mailed another QOV to a volunteer in Dutch John, UT. I am thankful for the long arm quilters who volunteer their time and talent. Partnering with these and other machine quilters has made it possible for me to complete 46 QOV in the last four years. 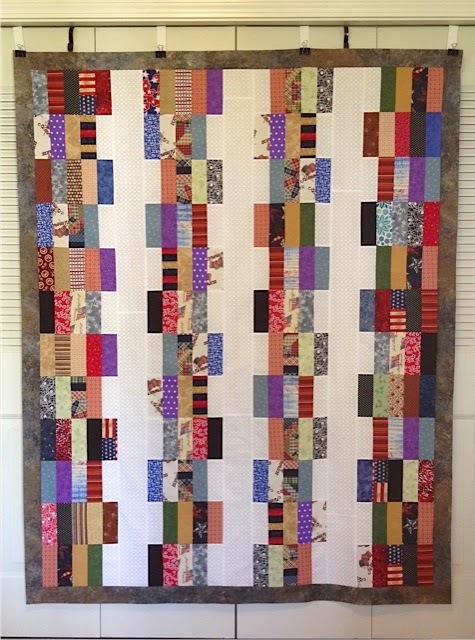 Another Quilt of Valor made from the scrap 2.5 inch strip bin. The pattern is written to make a 66 x 86 inch quilt; however, I down-sized the pattern since my color selection was limited to the scraps. Only the tone on tone white was from my fabric stash, the rest is from the scrap bin. Roll Call is QOV number 46 - made since 2010: a list of completed QOV can see seen here. I loved this pattern and will make another one. Jo was sweet and featured Roll Call on her blog here. In the days before remote controls, the channels had to be changed manually. I remember dials and buttons on various TVs. Remember the console models, the ones that were huge pieces of furniture? I used the console TV from the 1980s until approximately 2000. I marvel at the size of some flat screen TVs. They make sense if a house has a theater-style room, but to have an entire wall in a modest-sized home covered with a TV screen is a bit ridiculous in my opinion. Driving by these small houses with their large-screen TVs at night is almost like being in a drive-in theater, sans sound. Did you own a console TV? Have you made the transition to a flat screen? I'm not in the habit of taking photos in restrooms, but this toilet was most interesting. 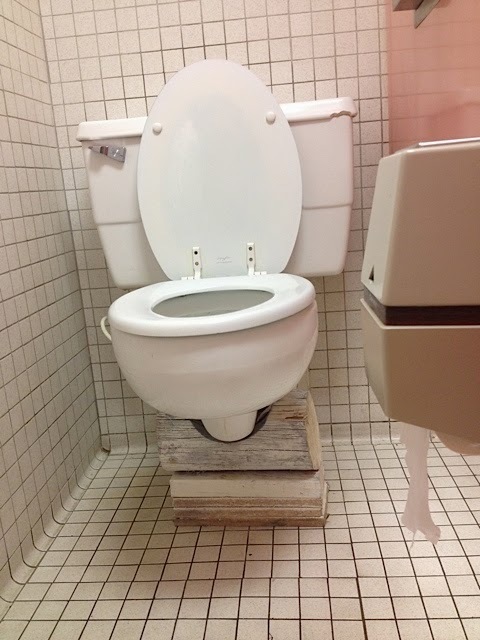 What this stool lacks aesthetically, it made up for by being "unique" and yet functional. Have you ever spotted any "interesting" plumbing? Singer Featherweight sewing machines are once more popular, especially with quilters because they are easy to transport to retreats. So when I spotted the little green box in a large bin at a local thrift shop, I immediately thought of Marti (The Next Fifty Years) who posted her "new" machine in January. From the photos, I knew Marti didn't have many attachments for her machine. 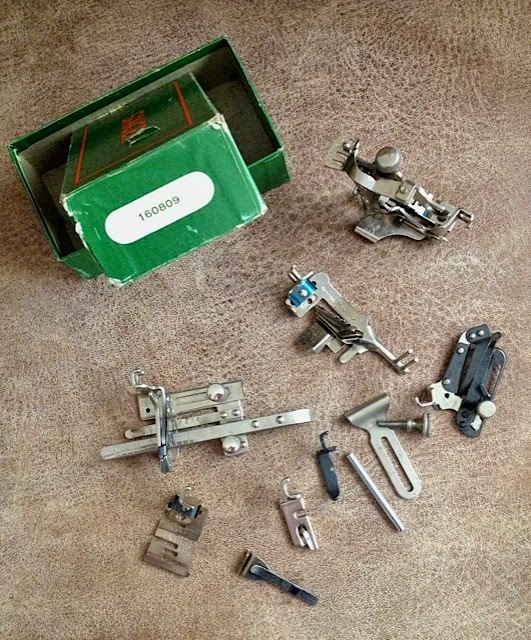 I recognized a few of the attachments (a ruffler, a rolled hem foot, a zipper foot, a seam gauge, a spool spindle) in the box, and the others can be identified here. The box of attachments is on its way to Marti. I hope she has fun experimenting with them. 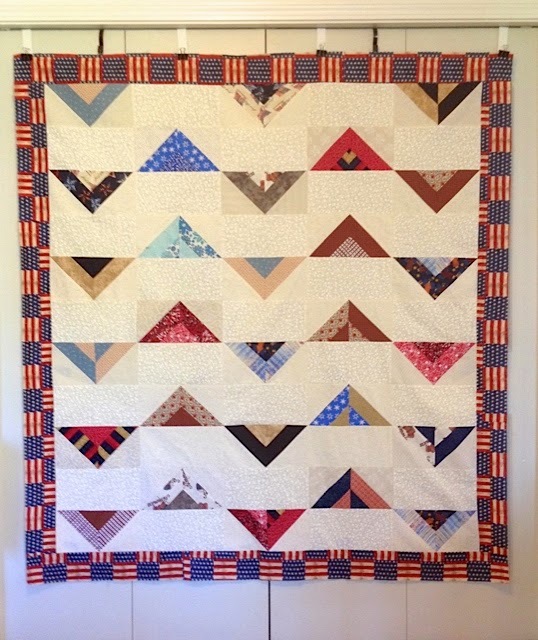 This pattern reminded me of banners flapping in the wind, so I used 2.5 inch scraps to create the banners and added a colorful patriotic fabric border. To me, this quilt says, "strike up the band!" The multiple bias edges were somewhat controlled by starching every time I pressed. 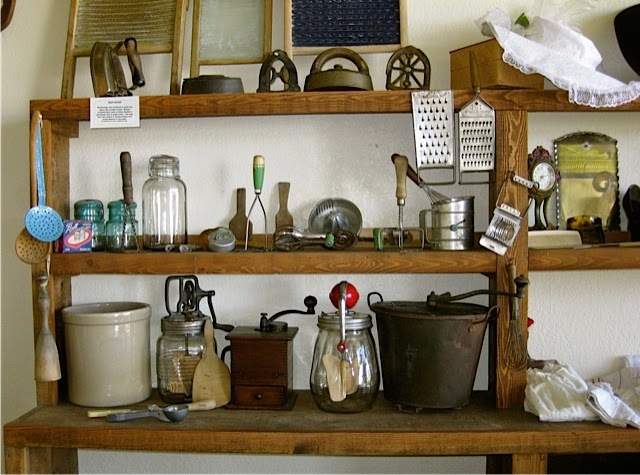 To celebrate Labor Day, let's see how many of these items you can recognize. These everyday tools made "woman's work" much easier, and thankfully, their invention lead to even more time-saving gadgets. Which item, albeit modernized, do you use the most?